Anyone who’s interested in creating their own spells. While I’m a cottage witch myself, I’m going to try to write this in the most general sense I can so that it might apply to anyone. However, keep my practice in mind as it may flavor my response. Why create your own spells? So you’ve decided that you need a spell for a specific reason. There’s an alternative to searching online or flipping through books, going to the store for the missing ingredients and waiting for the perfect time to do it. Instead, you could do your spell right now with things you have in your own home in a medium you’re most comfortable with. No more sachets when you like jars. No more ingredients if you’re more of an energy and intent kind of witch! 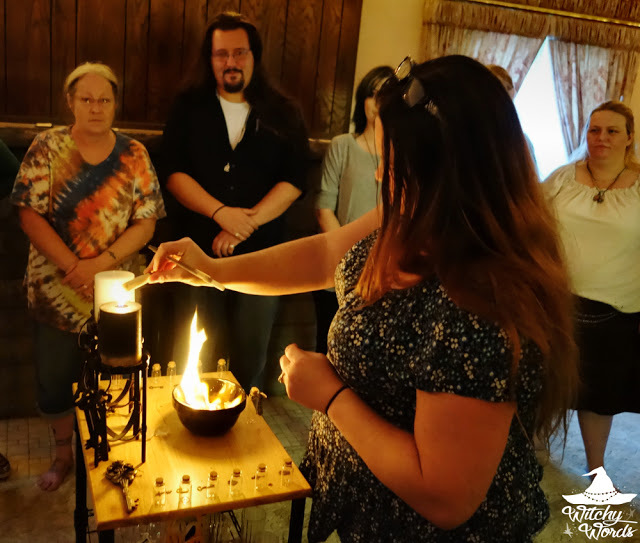 Plus, you can custom-tailor this spell for yourself - your own personal intent, the spirits and deities you work with, your environment and those around you. Your spell can be one-of-a-kind, made just for you. Having a firm grasp of spell building gives you that opportunity. What if I like pre-made spells? Sometimes, writing your own spell just takes too much time and effort. Every spell you create yourself is an experiment, meaning results aren’t always guaranteed (but are they ever?). Whatever the reason, if you’re comfortable working with pre-made spells, that’s totally fine. You don’t have to be able to build your own to be a witch or pagan. However, understanding basic spell building can help you analyze the validity of a pre-made spell and whether it will work for you. It is my personal opinion that every person who incorporates spell work of any kind into their practice or beliefs should have a general understanding of how spell building works for this reason. Not really. It depends on how involved you like your spells. Spell work can be as simple as intent. You see this when you wish on a star. You know birthday candles - when you make a wish and blow them out? 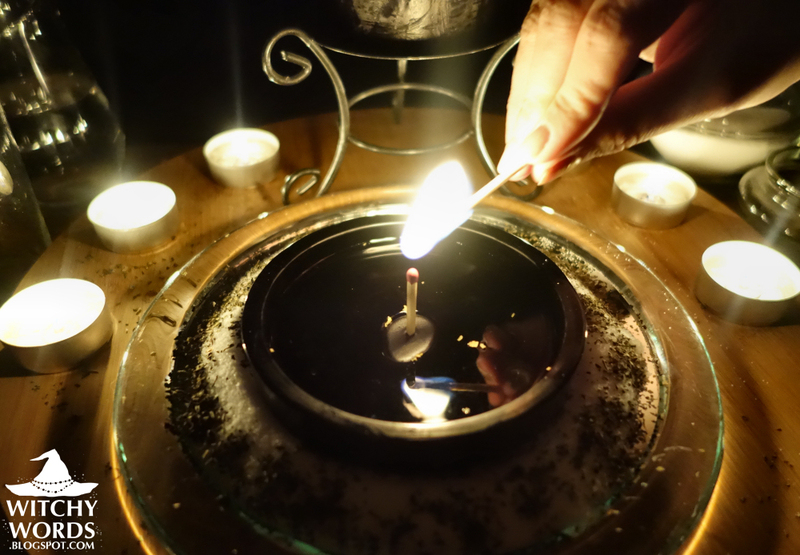 That’s also a valid spell that combines intent with certain tools (a candle, a cake) and timing (your birthday). Spells can be as easy or as complicated as you want them to be. Safety comes before all religious and craft activities. Your number one rule is to keep yourself and those around you as safe as possible. Don’t burn candles near highly-combustible material and keep a fire extinguisher on hand. Don’t ingest an herb without researching if it’s safe to eat and if it has any contradictions with your medication or known conditions. Examine every aspect of your spell for safety before performing it at all. If you’re doing a spell to get a job, you have to send out applications. If you’re doing a spell for extra money, but you keep turning down overtime at your work, you’re denying the opportunity to receive that money. Spells can’t manifest something out of nothing, and they rarely work if you’re not willing to put in the effort too. Do the work and you’ll see the results. Not optional in my opinion. 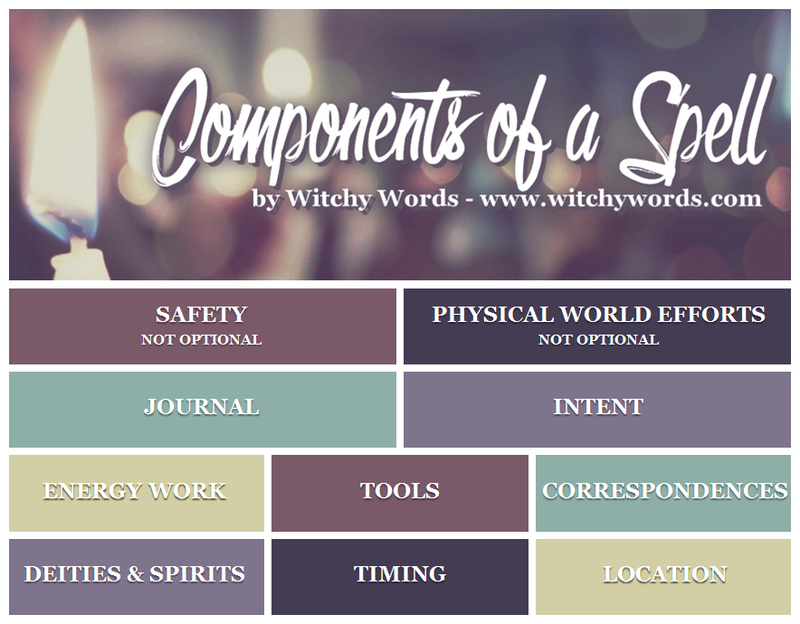 I would encourage all who utilize spells, be it pre-made or personally crafted, to keep a spell work journal. This journal will help you remember the spells you’ve done, when you did them, why you did them and if they worked. Go back through and review it often. Journals can also be a valuable brainstorming tool as you begin to build your own spells. This is your purpose for the spell. To get a new job? To find money? To be happier? To protect something? There are many reasons we do spells. If you want your spell work to be the most effective, however, you will want to dig to the very bottom root of your problem. The best method is to keep asking yourself why. Why do you need a new job? Is it because you don’t enjoy your current job or is it because it doesn’t pay enough? If you don’t enjoy your current job, why? Is it not the field you’d like to be in or is it something specific about your job? Why don’t you enjoy that specific aspect? See how your intent might change the more you dig at the problem? Also keep in mind that you’ll want your intent to be as specific as possible. If your intent is to find money, but you don’t specify how much or by when, you’ll be picking up pennies for the rest of your life. The word “energy” gets tossed around a lot like we’re just supposed to know what it means and what it feels like. Most can’t even define what energy is without using “energy” in the definition. Energy can’t be seen, so it makes it this mysterious force that seems somehow unattainable or uncontrollable, but everyone has the ability to utilize it. Energy could be defined as the constant motion or vibration that everything in this world experiences at the most sub-atomic level. Energy work is the process of utilizing that motion or vibration as a sort of flow or fuel to build momentum to your work. There are many ways to utilize energy, including: Visualization (giving your energy a shape or form in your mind), Grounding (stabilizing your energy or removing excess energy), Centering (reigning in all the extraneous energy your body is emitting into one stable place), Shielding (using your internal energy to create an external metaphysical barrier), Programming (giving your personal energy an intent or purpose), and Charging (filling an object with your energy that has an intent or purpose). Technically speaking, energy and intent is enough to form a spell. Incorporating your senses, giving your energy and intent a physical medium, can help you better visualize and direct the energy for a specific purpose. Tools can be anything from gems, herbs, candles, essential oils and incense to knives, mirrors, bells and chalices to string, jars, sachets and bottles to matches, pens, paper to electronic devices, batteries and metal to music, chanting, drumming and noise to food and drink and more. I could spend an eternity listing everything you might use to create a spell because literally anything in this world is a viable tool. If you’re just starting off, use tools that are familiar, that you know very well, and incorporate senses you’re comfortable with. You can choose to include no senses, one, three or all - but that’s a decision you have to make. You also need to decide if these tools need to be cleansed and consecrated and, if so, you will need to do that. If you’re going to utilize tools, having a good idea of the proper correspondences can further emphasize your energy and intent. For example, if you’re doing a spell for money, you’ll want to utilize green or gold. However, it’s not enough to blindly follow a correspondence chart. Why are certain herbs used for certain reasons? Look up the scientific uses and historical lore around your tools for a good idea of the why behind the correspondences they’re often given. As you grow in your craft, you may find that you develop a personal correspondence that differs from the science and history of a particular tool, something called unverified personal gnosis. If it works for you, go for it! That being said, while tools are optional, I see correspondences, whether it be historical, scientific or UPG, something that’s not optional if you’re utilizing tools. I’m nontheistic myself, but if you prefer to work with deities and/or spirits, they become an important component to your spell. If you do plan on using deities or spirits, be sure to research any specific offerings they may require or any calls they may need. I tend to do my spells when the need arises. I find acting on intense energy and intent alone is enough to fuel my work. However, if you want to tip the balance in your favor a little more or are new and concerned intent and energy won’t be enough, doing the spell at a favorable time could certainly help. There are many ways to tackle timing, including day of the week, hour of the day, moon phase, month, astrological sign, season and more. It’s up to you to determine what’s important to your work. For example, is the moon’s position in a certain astrological sign going to affect your work? If so, which sign would be best? Why the moon? Why not the sun? If the moon, will void of course hinder your work? These are all factors to consider if you’re going to work with timing in your spell. Sometimes, your kitchen is the best setting. Sometimes it’s the woods. Sometimes it’s your dining room table. Decide if you need to create a sacred space for your spell or if you’re comfortable just diving right in. In your journal, take a page or two for each step and attempt one of these (or any other) brainstorming activities. Take a moment to clearly define your intent. Keep asking yourself why until you find the root. Narrow that root down to a specific goal. Include quantity, timing, reasoning. You should be able to write your intent as a one-sentence statement at the end of this brainstorming activity. What kind of energy work would you need to do to accomplish your goal? Do you need tools or is energy work enough? If you’re going to use tools, what are your limitations? Are you wanting to build the spell from what you have around the home or are you willing to go out and purchase something? If so, what are your monetary limits? Can you get as loud as you want? Can you burn incense or are you limited in burning anything? You might start by listing out everything that would be relevant to your spell and then crossing out things that are inaccessible or unavailable, or you might take a stroll around your house and take snapshots of items that might be useful for your intent. There are many ways to go about this. Be sure to include any components to tools. For example, if you need candles, then you’ll probably need a lighter or matches. By the time you’re done, you should have a specific list of the kind of energy work and tools you’d like to use, the quantity of each tool and any specific precautionary safety tools, such as fire extinguishers, that you might need - or none at all, if that’s how you’d like to approach this. Are you going to do your spell at a certain time? If so, how specific do you plan on getting? Is the moon phase enough or do you need the astrological sign the moon is in as well? Or maybe you just need a certain day of the week or time of the day? Are you going to perform the spell in your kitchen or basement, or in your local woods? Do you need to create a sacred space, such as a circle? Consider all variables and decide what will work best for you. Once you’re ready and if needed, list out the specific time and location of your spell. Step Four: The Spell: What are you going to do? Now that you have your specific intent, a list of tools if needed, and the timing and location if needed, you’re ready to list out step-by-step exactly what you’re going to do. Start with the beginning with pre-spell activity, go through the spell and include any post-spell work, like cleaning up or grounding. Do you need to cleanse and consecrate your tools? Do you need to cleanse yourself? Are you forming a circle? Are you calling upon a deity or spirit? How? If you’re creating a sachet, what items go in first? What go in last? When do you charge them, if you plan on doing that? Before they go in or once the sachet is tied? How are you charging them? These are just some examples of how to think about your process. Be sure to write everything down, even if it seems common sense or silly to do so. You never know what you might forget when caught up in the moment. Step Five: Walk Away from It, then Come Back. Now that you have the majority of your spell in brainstorming format, take a break. Get some fresh air. Step away for an hour or two, or maybe even a day or two. Come back. Are there any more changes needed? Has your intent changed? Has the situation changed? Or is this exactly everything you need? After reading over your brainstorming activities for the spell, consider what do you need to do outside of this spell to achieve your intent. Write down every possible activity you can think of. If you’re looking for a job, attend local job fairs, apply to every business that suits your field or is within the vicinity you can apply for, rework your resume, post it up on job-seeking websites, crawl Craigslist. Pretend like you’re not going to use a spell at all and do everything you can to make this happen. Create a list of all physical world efforts and start now. Step Seven: Simplify your brainstorming activities into a list or worksheet! Good luck on creating your very own personalized spell! Roots of Ritual: What is a Spell? Thanks for all the helpful hints! Very useful for a newbie like me. Have you ever thought of writing a book? Thank you so much! I'm so glad it can help. I think, at some point, I'd love to tackle a book, but I don't feel like I'm knowledgeable enough for that yet. Maybe in the future though! Thanks for sharing in an organized list type format Marietta! I recently finally got my BOS started after gathering spells for over a year. Something about my OCD...I couldn't just write them in until I had a "collection". Now that I feel more knowledgeable, I will be branching into writing my own spells. I am excited and look forward to seeing how well they work compared to generic ones I have gathered thus far! I love this. Pre-made spells never resonate with me but I've really wanted to start doing spell work. I think this is just the key I need to really get started. Thank you so much. Could you please let me know a spell which helps me in convincing my parents to marry my love? I want something which works faster as there is no time left.